In the barren Southwest, a good portion of the 1,900-mile border between the United States and Mexico is being fortified with walls, electronic surveillance and trenches. But in San Diego, private investors on both sides of the border are taking a different tack, building a bridge to Tijuana International Airport with the expectation of turning it into a low-cost alternative to San Diego’s boxed-in, one-runway airport. 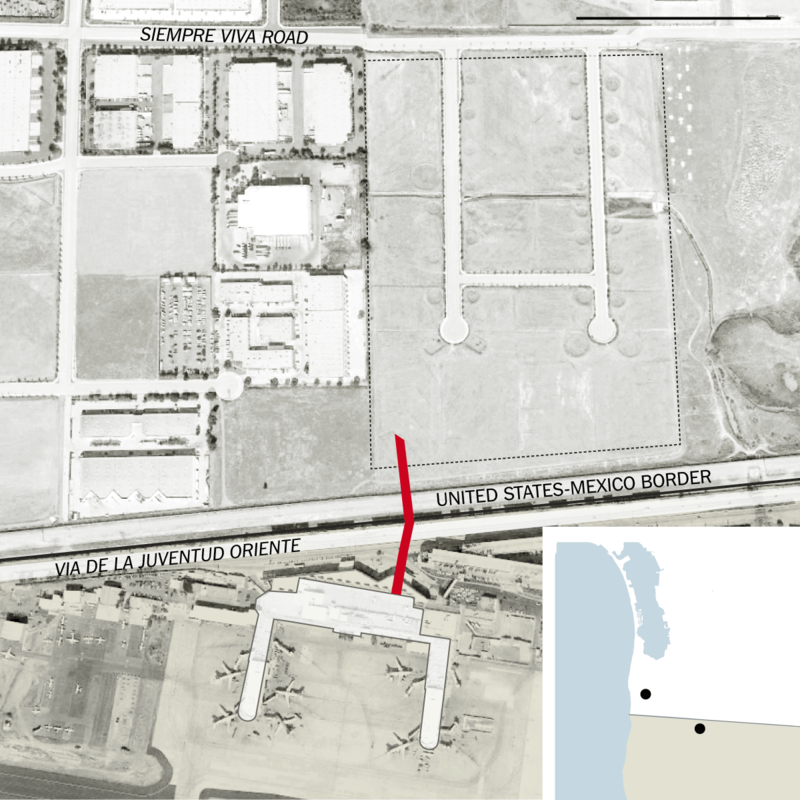 Next year, if all goes according to plan, air travelers in this region will be able to park their cars in the United States and walk across an enclosed 325-foot passageway directly to Tijuana International. The project would make Tijuana International a rare airport that would let passengers land in one country and leave in another. Two airports on the Swiss-French border allow for that, and a shuttle runs passengers with connecting flights between airports in Hong Kong and Shenzhen, across the border in mainland China. The effort, led by the Chicago real estate magnate Sam Zell, promises to help fulfill an early dream of the 20-year-old North American Free Trade Agreement: problem-free travel between Mexico and the United States. Each year, 2.4 million travelers from the United States use the Tijuana airport, even if it means waiting for hours at the border. They provide the airport with nearly 60 percent of its traffic. It is worth the trouble for those people because fares in Tijuana are substantially lower — up to 50 percent less to fly throughout Mexico — than at San Diego’s Lindbergh Field or other airports, like Los Angeles International. Gilberto Rodriguez, who is from Riverside, Calif., knows the routine well. On a recent chilly morning, he wheeled bags the size of small refrigerators along a pathway toward the Mexican border with his wife, Esperanza, as his two daughters scrambled to keep up. Once past the border, he would take a $12 cab ride to Tijuana International. Mr. Rodriguez figured he had saved $1,000 on their four tickets. With so many travelers like Mr. Rodriguez already using Tijuana, one of the busiest airports in Mexico, the project has gained broad support locally. But border initiatives can move slowly. There is frustration here, for instance, that while Mexico widened the San Ysidro crossing — the nation’s busiest — to 34 lanes in 2012, financing for expansion on the United States side has been hung up in Congress. “Local politicians understand the dynamics of the border,” said David Alvarez, a San Diego councilman and mayoral candidate whose district includes the bridge. The bridge is not the first, or grandest, attempt to provide an alternative to the San Diego airport. There have been proposals to convert the nearby Marine Corps Air Station to a civilian airport, to connect a new airport in the desert 70 miles east by high-speed rail, and even to expand the San Diego airport, also known as Lindbergh Field, onto floating runways over the ocean. The bridge itself has its roots in one of the most ambitious of those proposals: a $2 billion conversion of Tijuana International into a cross-border airport. That plan, put forward in the early 1990s after the adoption of Nafta, called for Mexican and American air traffic controllers, and terminals and runways on each side of the border. The project died when the United States government balked. But it gave way to a more modest plan. In 2007, Equity Group Investments, led by Mr. Zell, formed a partnership with a pair of Mexican investment companies with ties to Grupo Aeroportuario del Pacífico, a public-private partnership that operates 12 airports in Mexico, including Tijuana. A year later, the company, Otay-Tijuana Venture, bought vacant land on the American side for $34 million. Developers have been negotiating for several months with United States Customs and Border Protection, which would operate the checkpoints, and waiting to obtain building permits from the City of San Diego. Federal and local officials said final approval on those issues was expected soon. The bridge would operate like any of the six other border crossings in California, said Jackie Wasiluk, a spokeswoman for Customs and Border Protection, except that an airline ticket would be required to pass through it. Operators of the bridge will bear the cost of the border agents. A big part of the bridge’s appeal is that it will ease some traffic at the two nearest border crossings, Otay Mesa and San Ysidro, where cars routinely face long waits to cross. Using the bridge is expected to cost $13 to $17, though the final fees have not been set, according to Stephanie Saathoff, a spokeswoman for Otay-Tijuana Venture. Though Ms. Saathoff said such fees would be the primary source of revenue, there would also be parking fees. And there is potential for other development — like hotels, retail shops and convenience stores — on 31 acres on the American side. The interest in the project for Grupo Aeroportuario del Pacífico, the airport company, is harder to quantify. The bridge is unlikely to spur any immediate development, said Miguel Aliaga, an investor relations officer for the airport company. And Salvador Aguirre, a taxi driver, is not happy that he will lose business, saying he counts on eight to 10 trips a day from the border to the airport during holiday seasons. But a growing airport that sends more people into Tijuana fits into the development efforts of a city that is seeking to project a safer, more cosmopolitan image. And for travelers like Mr. Rodriguez, who learned of the plan as he headed toward the border, the bridge would be a welcome relief. “That would be perfect,” he said. 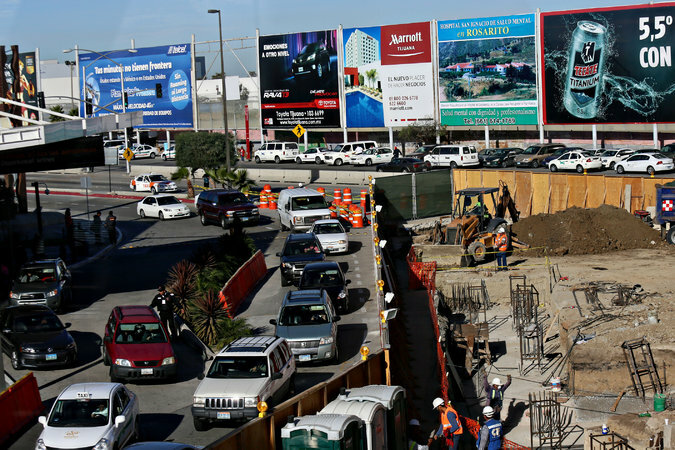 A version of this article appears in print on January 20, 2014, on page B2 of the New York edition with the headline: A Project Will Put the Tijuana Airport’s Parking Just Over the Border.